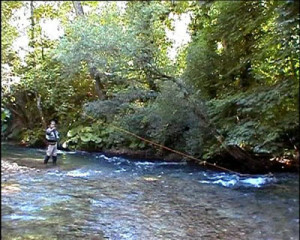 There are various casts that are finalised at getting your fly under overhanging bushes. Some are more difficult while others slightly easier; among the latter, one of the most efficient and at the same time not particularly difficult to do is the totally under the tip cast. If we analyze the dynamics of the totally under tip cast, you will notice that it is the result of completely natural – almost spontaneous movements. Contrarily to the classical under tip cast, the totally under tip cast is executed in a completely different way. The first operation is a back cast on a horizontal plane with the line behind us but at the same height as the tip of the rod. Maintaining a parallel line behind us will facilitate the forward cast and will prevent dangerous rotations of your pulse at the moment when you change the line’s trajectory. Doing false casts under the tip will let you keep harmony in your cast and most important will help to be accurate because during the preparatory movements you will have already taken the right distances. In other words, if you cast normally with an angular cast, you risk during the final cast especially and if you are not particularly expert, to send the fly in a completely different direction. The dynamics of the cast which generate this peculiar change in levels (forward cast)in the totally under tip cast are the following: when you start the forward cast, you will rotate your wrist which then continues on an inclined plane upwards until the hand has gone 25/30 cm past your hip. You will notice right from the beginning phase of the cast that the loop will be parallel to the water and the line will pass totally under the rod tip. Getting back to the point when the rod has passed your hip by 25/30 cm – in this precise moment you start the Thrust which takes place when the wrist is not straightened out yet but at about a 30° angle. It is in this moment that you rotate the wrist in what can be defined as a scooping movement which is at the heart of this cast. At the same time the tip of the rod is brought upwards for two reasons. The first reason is to prevent the line from hitting the water and the second one is to increase the difference in height between the moments when the line is stopped and when it is in movement which is the element which allows you to create the peculiar shape of the loop which in this case is a horizontal V shape which is completely different from the classical under tip cast. The left hand does a mini double traction because a constant traction or if you keep your hand still, would not create the right tension which the cast requires because of the horizontal dynamics and a continuous change of levels. The final result will be a rod which is inclined upwards, a line which is still and at an angle downwards and a horizontal loop. The movement is actually easier than it looks but it is important to carry it out without ever stopping and with a continuous movement. Between the line when it is still and when it is in movement you will notice the typical acute angle without a diverging loop which instead is the result of the classical under tip cast which is used to change the plane of the line from vertical to horizontal. The totally under tip cast can be used for other reasons too. When executed slowly it can be used to do curved casts. To do this you need to work with your left hand that releases the line early and this slows down the line speed so that the loop falls on the water as it is – a real curved cast. In conclusion, the totally under tip cast can be considered a true “fishing” cast when used to get round certain fishing situations. This to confirm that some casts are wrongly defined as “lawn” or “trick” casts because they are more spectacular than practical. This is definitely not the case with the totally under tip cast.